The Telemetry Coverage measurement will sample a portion of all Firefox clients and report whether telemetry is enabled. This measurement will not include a client identifier and will not be associated with our standard telemetry. Mozilla's blog is bitching on Facebook and bragging about how Mozilla is taking privacy seriously, being transparent and stuff, but for dog's sake, installing a spyware, err… a debug addon that doesn't even shows up in the regular addon tab, without telling me anything, to snitch if I explicitly disabled telemetry precisely because I don't trust Mozzila for not having this kind of shady behaviour is a whole new level of dickery. 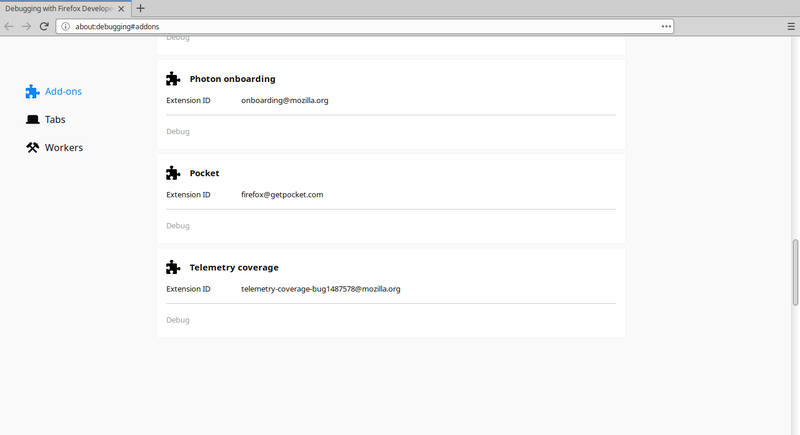 telemetry-coverage.mozilla.org. 3599 IN CNAME   telemetry-coverage.r53-2.services.mozilla.com. telemetry-coverage.r53-2.services.mozilla.com. 300 IN CNAME telemetry-coverage-1699465515.us-west-2.elb.amazonaws.com. us-west-2.elb.amazonaws.com. 157 IN NS  ns-1475.awsdns-56.org. us-west-2.elb.amazonaws.com. 157 IN NS  ns-1769.awsdns-29.co.uk. us-west-2.elb.amazonaws.com. 157 IN NS  ns-332.awsdns-41.com. us-west-2.elb.amazonaws.com. 157 IN NS  ns-560.awsdns-06.net. This is absolutely not ok Mozilla.